Frequent activity at Lokon-Empung since early 2011 has typically included small explosions amid seismic unrest. Eruptions from the active Tompaluan crater, in the saddle between the peaks of Lokon and Empung, took place during September 2012-September 2013, May 2015, and August-September 2015. The volcano is monitored by the Pusat Vulkanologi dan Mitigasi Bencana Geologi (PVMBG). The Alert Level has been set at 3 (on a 4 level system) since July 2011, and residents and tourists have been warned not to approach the crater within a radius of 2.5 km. Activity during 2011-2014. A brief explosion on 11 February 2011 was followed by an eruptive period lasting a year, from 26 June 2011 through 1 May 2012. Activity resumed again on 15 September 2012, and was continuing as of mid-April 2013 (BGVN 38:03). Although there were no further reports of explosive activity until September, thermal anomalies were observed on 5 July 2013 (2 pixels) at or near Tompaluan Crater, based on MODIS satellite data analyzed using MODVOLC. An ash plume rising to an altitude of 1.8 km and drifting N on 9 September 2013 was reported by the Darwin Volcanic Ash Advisory Centre (VAAC) based on ground reports from PVMBG. Ash was not detected in satellite images due to meteorological clouds. According to a news article (Jakarta Post), an explosion at 0630 generated an ash plume that rose 1.5 km; the explosion was heard 10 km away. Darwin VAAC noted that during the next day, ash plumes rose to an altitude of 2.4 km, although ash was again not identified in satellite images. A spokesperson from the PVMBG told the Jakarta Post that activity declined after 9 September, including the frequency of deep and shallow volcanic earthquakes. A year later, PVMBG reported that during 8-14 September 2014 observers saw white plumes rising 25-100 m above Tompaluan Crater. On 13 September three explosions from the crater, at 0300, 1146, and 1229, produced thick white plumes that rose at most 500 m above the crater. Seismicity decreased sharply after the 13 September events, but continued to remain high relative to the levels detected previously. Activity during 2015. According to PVMBG, observers saw white plumes rising 25-50 m above Tompaluan Crater during 6-13 May 2015, although bad weather often prevented observations. Seismicity fluctuated but slightly decreased overall. An eruption on 20 May 2015 from the crater generated an ash plume that, according to the Darwin VAAC, rose as high as 3 km and drifted NNW (figure 17). The eruption was accompanied by loud "thumping" noises heard at the local observation post. During 21-27 May, thick grayish-white plumes rose as high as 150 m. Bad weather prevented satellite views. Seismicity fluctuated but generally continued to decrease slightly. Figure 17. Photo of Lokon-Empung erupting on 20 May 2015. The Lokon cone is hidden by the ash plume from Tompaluan Crater; Gunung Empung is to the right. View is approximately NNW from Tomohon City. Courtesy of Piet Hein Pusung. Figure 18. Photo of Lokon-Empung erupting on 20 May 2015. The ash plume from Tompaluan Crater is rising above Gunung Lokon (left). View is approximately NNW from Tomohon City. Courtesy of Piet Hein Pusung. PVMBG reported that during 10-17 June 2015, observers at the Lokon Observation Post in Kakaskasen Tomohon (4 km from the crater), saw white plumes rising as high as 450 m above the crater. The number of volcanic earthquakes fluctuated and signals indicating emissions were detected almost daily. During 15-22 July observers saw white plumes rising as high as 75 m above the crater. The number of volcanic earthquakes declined but still remained higher than levels recorded during 25 May-10 July. Signals indicating emissions were occasionally detected. According to the Darwin VAAC, PVMBG reported that on 30 August an ash plume rose to an altitude of 3 km. Ash was not identified in satellite images. According to a news account (Jakarta Post), ashfall occurred in Manado (15 km N) to North Minahasa (43 km NE). Another news account (Regional kompas.com) reported that thick volcanic ash covered the runways at Sam Ratulangi Airport in Manado, delaying some flights. Thermal anomalies at or near Tompaluan Crater, based on MODIS satellite instruments analyzed using the MODVOLC algorithm, were observed on 24 September 2015 (1 pixel). The MIROVA (Middle InfraRed Observation of Volcanic Activity) system detected six hotspots within 5 km of Lokon-Empung during September 2015, two early in the month and four near the end. Although inclement weather sometimes obscured views, PVMBG reported that during 28 October-24 November 2015 observers saw white plumes rising as high as 400 m above the crater. Seismicity fluctuated, but the seismic spectral amplitude measurement (SSAM) showed a gradually increasing trend. Information Contacts: Pusat Vulkanologi dan Mitigasi Bencana Geologi (PVMBG, also known as Center of Volcanology and Geological Hazard Mitigation (CVGHM), Jalan Diponegoro 5+7, Bandung 40122, Indonesia (URL: http://www.vsi.esdm.go.id/); Darwin Volcanic Ash Advisory Centre (VAAC), Bureau of Meteorology, Northern Territory Regional Office, PO Box 40050, Casuarina, NT 0811, Australia (URL: http://www.bom.gov.au/info/vaac/); Hawai'i Institute of Geophysics and Planetology (HIGP) MODVOLC Thermal Alerts System, School of Ocean and Earth Science and Technology (SOEST), Univ. of Hawai'i, 2525 Correa Road, Honolulu, HI 96822, USA (URL: http://modis.higp.hawaii.edu/); MIROVA, a collaborative project between the Universities of Turin and Florence, Italy (URL: http://www.mirovaweb.it/); The Jakarta Post (URL: http://www.thejakartapost.com/); Jakarta Globe (URL: http://jakartaglobe.id/); Regional Kompas.com (URL: http://regional.kompas.com/); Piet Hein Pusung (URL: https://twitter.com/PietHeinPusung). Although inclement weather sometimes obscured views of Lokon-Empung's Tompaluan Crater, PVMBG reported that during 1-14 September observers at the post in Kakaskasen Tomohon (North Sulawesi, 4 km from the crater) saw white plumes rising as high as 250 m above the crater. The number of shallow volcanic earthquakes was the highest on 1 September (20 recorded), and then fluctuated between 1 and 4 per day during 2-14 September. The Alert Level remained at 2 (on a scale of 1-4). Residents and tourists were reminded not to approach the crater within a radius of 1.5 km. Although inclement weather sometimes obscured views of Lokon-Empung's Tompaluan Crater, PVMBG reported that during 5 February-8 March observers at the post in Kakaskasen Tomohon (North Sulawesi, 4 km from the crater) saw white plumes rising as high as 200 m above the crater. Seismicity increased; shallow volcanic earthquakes notably increased on 6 March. Deformation data indicated inflation. The Alert Level was raised to 3 (on a scale of 1-4) on 8 March due to significant increases in deformation and seismic data. Residents and tourists were reminded not to approach the crater within a radius of 2.5 km. Although inclement weather sometimes obscured views of Lokon-Empung's Tompaluan Crater, PVMBG reported that during 1 December 2015-4 February 2016 observers at the post in Kakaskasen Tomohon (North Sulawesi, 4 km from the crater) saw white plumes rising as high as 400 m above the crater. Seismicity fluctuated but decreased overall. No deformation was detected. The Alert Level was lowered to 2 (on a scale of 1-4) on 5 February. Residents and tourists were reminded not to approach the crater within a radius of 1.5 km. Although inclement weather sometimes obscured views of Lokon-Empung's Tompaluan Crater, PVMBG reported that during 30 December-7 January observers at the post in Kakaskasen Tomohon (North Sulawesi, 4 km from the crater), saw white plumes rising as high as 250 m above the crater. Seismicity fluctuated, and was dominated by shallow volcanic earthquakes and signals indicating emissions; the number of shallow volcanic earthquakes significantly increased on 3 January. The Alert Level remained at 3 (on a scale of 1-4). Residents and tourists were reminded not to approach the crater within a radius of 2.5 km. Although inclement weather sometimes obscured views of Lokon-Empung's Tompaluan Crater, PVMBG reported that during 10-16 December observers at the post in Kakaskasen Tomohon (North Sulawesi, 4 km from the crater), saw white plumes rising as high as 150 m above the crater. Seismicity fluctuated, but the seismic spectral amplitude measurement (SSAM) showed a gradual and significant increasing trend over the previous 3-4 months. The Alert Level remained at 3 (on a scale of 1-4). Residents and tourists were reminded not to approach the crater within a radius of 2.5 km. Although inclement weather sometimes obscured views of Lokon-Empung's Tompaluan Crater, PVMBG reported that during 3-10 December observers at the post in Kakaskasen Tomohon (North Sulawesi, 4 km from the crater), saw white plumes rising as high as 400 m above the crater. Seismicity fluctuated, but the seismic spectral amplitude measurement (SSAM) had shown a gradually increasing trend over the previous 3-4 months. The Alert Level remained at 3 (on a scale of 1-4). Residents and tourists were reminded not to approach the crater within a radius of 2.5 km. Although inclement weather sometimes obscured views of Lokon-Empung's Tompaluan Crater, PVMBG reported that during 26 November-3 December observers at the post in Kakaskasen Tomohon (North Sulawesi, 4 km from the crater), saw white plumes rising as high as 350 m above the crater. Seismicity fluctuated, but the seismic spectral amplitude measurement (SSAM) showed a gradually increasing trend. The Alert Level remained at 3 (on a scale of 1-4). Residents and tourists were reminded not to approach the crater within a radius of 2.5 km. Although inclement weather sometimes obscured views of Lokon-Empung's Tompaluan Crater, PVMBG reported that during 12-19 November observers at the post in Kakaskasen Tomohon (North Sulawesi, 4 km from the crater), saw white plumes rising as high as 400 m above the crater. Seismicity fluctuated, but the seismic spectral amplitude measurement (SSAM) showed a gradually increasing trend. The Alert Level remained at 3 (on a scale of 1-4). Residents and tourists were reminded not to approach the crater within a radius of 2.5 km. Although inclement weather sometimes obscured views of Lokon-Empung's Tompaluan Crater, PVMBG reported that during 5-12 November observers at the post in Kakaskasen Tomohon (North Sulawesi, 4 km from the crater), saw white plumes rising as high as 300 m above the crater. Seismicity fluctuated, but the seismic spectral amplitude measurement (SSAM) showed a gradually increasing trend. The Alert Level remained at 3 (on a scale of 1-4). Residents and tourists were reminded not to approach the crater within a radius of 2.5 km. Although inclement weather sometimes obscured views of Lokon-Empung's Tompaluan Crater, PVMBG reported that during 28 October-5 November observers at the post in Kakaskasen Tomohon (North Sulawesi, 4 km from the crater), saw white plumes rising as high as 125 m above the crater. Seismicity fluctuated, but the seismic spectral amplitude measurement (SSAM) showed an increasing trend. The Alert Level remained at 3 (on a scale of 1-4). Residents and tourists were reminded not to approach the crater within a radius of 2.5 km. According to the Darwin VAAC, PVMBG reported that on 30 August an ash plume rose from Lokon-Empung to an altitude of 3 km (10,000 ft) a.s.l. Ash was not identified in satellite images. PVMBG reported that during 10-17 June observers at the Lokon Observation Post in Kakaskasen Tomohon, North Sulawesi (4 km from the crater) reported that although inclement weather sometimes obscured views of Lokon-Empung's Tompaluan Crater, white plumes were observed rising as high as 450 m above the crater. The number of volcanic earthquakes fluctuated and signals indicating emissions were detected almost daily. The Alert Level remained at 3 (on a scale of 1-4). Residents and tourists were reminded not to approach Tompaluan Crater within a radius of 2.5 km. PVMBG reported that an eruption at 1520 on 20 May from Lokon-Empung's Tompaluan Crater generated an ash plume that rose 1.5 km and drifted NNW. The eruption was accompanied by loud "thumping" noises heard at the local observation post. During 21-27 May white plumes rose as high as 150 m. Seismicity fluctuated but slightly decreased overall. The Alert Level remained at 3 (on a scale of 1-4). Residents and tourists were reminded not to approach Tompaluan Crater within a radius of 2.5 km. PVMBG reported that during 6-13 May observers of Lokon-Empung noted white plumes rising 25-50 m above Tompaluan Crater, although inclement weather often prevented observations. Seismicity fluctuated but slightly decreased overall. The Alert Level remained at 3 (on a scale of 1-4). Residents and tourists were reminded not to approach Tompaluan Crater within a radius of 2.5 km. Based on ground observations, the Darwin VAAC reported that an ash plume rose to an altitude of 3 km (10,000 ft) a.s.l. on 20 May. Inclement weather prevented satellite views of the volcano. According to a news article, a spokesperson from the Pusat Vulkanologi dan Mitigasi Bencana Geologi (PVMBG) stated that activity at Lokon-Empung continued to decline after a 9 September eruption. The frequency of deep and shallow volcanic earthquakes had continued to decline. Based on ground reports from CVGHM, the Darwin VAAC reported that on 9 September an ash plume from Lokon-Empung rose to an altitude of 1.8 km (6,000 ft) a.s.l. and drifted N. Ash was not detected in satellite images due to meteorological clouds. According to a news article an explosion at 0630 generated an ash plume that rose 1.5 km; the explosion was heard 10 km away. The VAAC noted that the next day ash plumes rose to an altitude of 2.4 km (8,000 ft) a.s.l. although ash was again not identified in satellite images. Based on both web-camera views and ground reports, the Darwin VAAC reported that on 11 April an ash plume from Lokon-Empung rose to an altitude of 4.6 km (15,000 ft) a.s.l. and drifted SW. Ash was not detected in satellite imagery. Based on both CVGHM and ground reports, the Darwin VAAC reported that on 3 April an eruption from Lokon-Empung produced an ash plume that rose to altitudes of 3-3.4 km (10,000-11,000 ft) a.s.l. and drifted S and SE. On 8 April an ash plume rose to an altitude of 4.6 km (15,000 ft) a.s.l. and drifted SW. Ash was not detected in satellite imagery. According to news articles, Lokon-Empung erupted twice on 31 January, producing an ash plume that rose 800 m after the first eruption. Seismicity had increased the day before. In another article the head of the Lokon observation post reported that eruptions from Lokon occurred daily, and specifically that nine eruptions had occurred on 2 February. Based on a ground report from CVGHM, the Darwin VAAC reported that an ash plume from Lokon-Empung rose to an altitude of 4 km (13,000 ft) a.s.l. on 3 February. Ash was not detected in satellite imagery. Based on reports from CVGHM and ASHTAMs (a special NOTAM for volcanic ash), the Darwin VAAC reported that ash plumes rose from Lokon-Empung rose to altitudes of 3.7-4.5 km (12,000-14,800 ft) a.s.l. during 15-16 January. Ash was not detected in satellite imagery. Based on ground reports from CVGHM, the Darwin VAAC reported that ash plumes rose from Lokon-Empung rose to an altitude of 2.4 km (8,000 ft) a.s.l. Ash was not detected in satellite imagery. Based on ground reports from CVGHM, the Darwin VAAC reported that ash plumes rose from Lokon-Empung on 17 December. Based on information from CVGHM and the WAAA MWO (in Ujung Pandang,Indonesia), the Darwin VAAC reported that an eruption from Lokon-Empung produced an ash plume that rose to an altitude of 3.4 km (11,000 ft) a.s.l. on 6 December and drifted S. Ash was not detected in satellite imagery. On 10 December a plume rose to an altitude of 4.3 km (14,000 ft) a.s.l. According to the Darwin VAAC, CVGHM reported that an eruption from Lokon-Empung produced an ash plume that rose to an altitude of 4.9 km (16,000 ft) a.s.l. on 28 November. Ash was not detected in satellite imagery. Based on a SIGMET, the Darwin VAAC reported that on 11 November an ash plume from Lokon-Empung rose to an altitude of 1.5 km (5,000 ft) a.s.l. According to the Darwin VAAC, ground-based observers reported that on 21 September an ash plume from Lokon-Empung rose to an altitude of 3 km (10,000 ft) a.s.l. Ash was not identified in satellite imagery. According to the Darwin VAAC, ground-based observers reported that on 15 September an ash plume from Lokon-Empung rose to an altitude of 3 km (10,000 ft) a.s.l. On 15 September satellite imagery showed an ash plume drifting 185 km SE. According to the Darwin VAAC, ash plumes from Lokon-Empung, that rose to an altitude of 3.7 km (12,000 ft) a.s.l. and drifted 75 km N, were detected in satellite imagery and reported by ground-based observers. CVGHM reported that during the morning on 24 April diffuse white plumes rose 25-50 m above Tompaluan crater, in the saddle between the Lokon-Empung peaks. Later that day an eruption was accompanied by loud "thumping" noises heard at local observation posts, though fog prevented views of the crater. The next day diffuse white plumes rose 50-100 m above the crater. The Alert Level remained at 3 (on a scale of 1-4). According to news articles, an explosion from the Tompaluan crater, in the saddle between the Lokon-Empung peaks, produced an ash plume that rose as high as 2 km above the crater on 10 February; loud "thumping" noises were also heard. Based on information from CVGHM, the Darwin VAAC reported ash plumes that rose to altitudes of 3-3.4 km (10,000-11,000 ft) a.s.l. during 10-12 February, though clouds prevented the detection of ash in satellite imagery. CVGHM reported that on 27 December seismic activity at Lokon-Empung suggested that an eruption had occurred, but fog prevented visual observations of the crater area. CVGHM noted on 28 December that the Alert Level remained at 3 (on a scale of 1-4), and reminded residents and tourists to not approach within a 2.5 km radius of the crater. Based on information from CVGHM, the Darwin VAAC reported that on 29 December an ash plume rose to an altitude of 3.7 km (12,000 ft) a.s.l. According to a news article, three explosions from the Tompaluan crater, in the saddle between the Lokon-Empung peaks were recorded by the CVGHM on 27 December. CVGHM recorded 23 deep volcanic tremors and 40 shallow volcanic tremors. Residents and tourists were not permitted within a 2.5 km radius of the crater. Based on visual and seismic observations during 27-28 December, the Alert Level remained at 3 (on a scale of 1-4). The Darwin VAAC reported a low-level eruption on 27 December based on media reports. According to a news article, a gray plume rose 1.2 km above Tompaluan crater, in the saddle between the Lokon-Empung peaks, and drifted SW on 26 October, followed by an explosion that sent incandescent material as far as 800 m away from Tompaluan crater. A second eruption produced a plume that rose 500 m above the crater. CVGHM reported that on 10 October white and gray plumes rose 100-300 m above Tompaluan crater, in the saddle between the Lokon-Empung peaks. Based on information from CVGHM, the Darwin VAAC reported that on 11 October an ash plume rose to an altitude of 2.1 km (7,000 ft) a.s.l. The Alert Level remained at 3 (on a scale of 1-4). CVGHM reported that during 24 July-8 August seismicity decreased at Tompaluan crater, in the saddle between the Lokon-Empung peaks, with a drastic reduction on 26 July. During 27 July-8 August white plumes rose 100-400 m above the crater. The Alert Level remained at 3 (on a scale of 1-4). Residents and tourists were not permitted within a 3-km radius of the crater. CVGHM reported that during 20-21 July seismicity and visual observations of Tompaluan crater, in the saddle between the Lokon-Empung peaks, indicated that activity continued to be high. On 20 July plumes rose 100-500 m above the crater, and during 21-24 July white plumes rose 100-300 m above the crater. CVGHM noted that, since the eruption on 18 July, most data showed a decline in activity and therefore on 24 July the Alert Level was lowered to 3 (on a scale of 1-4). Residents and tourists were not permitted within a 3-km radius of the crater. A news article stated that on that same day about 5,000 residents that had evacuated returned home, and about 200 people remained in shelters. According to news articles, three eruptions during 14-15 July from Tompaluan crater, in the saddle between the Lokon-Empung peaks, ejected lava and ash, and caused forest fires on the W flank. A local mayor noted that 6,000 people were in shelters and one person had died from a heart attack while evacuating. Other articles stated that 5,200 people had evacuated. Explosions during 17-18 July produced ash plumes that rose 0.6-3.5 km above the crater. CVGHM reported that during 28 June-9 July white plumes rose 50-400 m above Tompaluan crater, in the saddle between the Lokon-Empung peaks, and gray ash plumes rose 100-500 m above the crater. An ash eruption on 10 July produced white-to-gray plumes that rose 200-400 m above the crater. Fluctuations in the sulfur dioxide gas emission rate were noted during 30 June-10 July. Based on gas flux, seismicity, visual observations, and hazard assessment CVGHM raised the Alert Level to 4 (on a scale of 1-4). On 11 July, the Darwin VAAC reported that ash plumes detected in satellite imagery rose to an altitude of 1.5 km (5,000 ft) a.s.l. and drifted NW. According to news articles, close to 1,000 residents were evacuated from the area during 11-12 July. CVGHM reported that during 1-25 June white plumes rose 50-200 m above Tompaluan crater, in the saddle between the Lokon-Empung peaks. On 26 June a phreatic eruption ejected material that fell around the crater and produced a gray plume that rose 400 m above the crater rim and drifted N. Seismicity increased the next day and white plumes rose 50-200 m above the crater. The Alert Level was raised to 3 (on a scale of 1-4). Visitors and residents were prohibited from going within a 3-km radius of the crater. According to news articles, a phreatic eruption from Tompaluan crater, in the saddle between the Lokon-Empung peaks, produced an ash plume that rose 400 m above the crater rim and drifted SE on 22 February. CVGHM reported that on 28 February the Alert level for Lokon-Empung was lowered from 3 to 2 (on a scale of 1-4) due to a decrease in seismicity during 3-26 February, analysis of visual observations, and a lack of deformation. During 14-26 February, white plumes rose to an altitude of 1.7 km (5,600 ft) a.s.l. Visitors and tourists were prohibited from going within a 1-km radius of the crater. CVGHM raised the Alert Level for Lokon-Empung from 2 to 3 (on a scale of 1-4) on 9 December based on visual observations, inflation detected by deformation instruments, and an increase in seismicity. The water in the Tompaluan crater changed color from green to gray and noises from degassing became stronger. White plumes rose from the crater to an altitude of 1.6 km (5,200 ft) a.s.l. Visitors and tourists were advised not to go within a 2-km radius of the crater. According to a report from aircraft personnel, on 12 September at 1510 an ash plume emitted from Lokon-Empung rose to a height of ~7.6 km a.s.l. and drifted W. The plume was not visible on satellite imagery. After an explosion on 1 April at Lokon-Empung, volcanic activity decreased through 6 April. A "white-thick ash plume" rose to low levels and there were no observations of ash explosions. Seismicity after the 1 April explosion was dominated by tremor due to the release of gases. Lokon-Empung remained at Alert Level 2 (on a scale of 1-4). Beginning on 31 March the number of volcanic earthquakes at Lokon-Empung was relatively high. On 1 April at 2242 an explosion produced an ash column to a height of ~1.5 km over the crater. Ash drifted SSE and accumulated as an up to 1-mm-thick layer in the town of Tomohon. Incandescent material was hurled to ~350 m high and cascaded around the crater. Through 0900 on 3 April tremor earthquakes continued to be recorded. Lokon-Empung remained at Alert Level 2 (on a scale of 1-4). VSI decreased the Alert Level at Lokon-Empung on 24 March from 3 to 2 (on a scale of 1-4) due to a decrease in volcanic activity. During 17-23 March, "white-thick ash emissions" rose to ~300 m above Tompaluan crater, ash explosions occurred, and there was a significant decrease in emission earthquakes compared to the previous week. On 27 March at 0156 an explosion ejected ash to 1.5 km and incandescent volcanic material to 400 m above the crater. An ash cloud drifted S and ash fell around the summit. Ash was not visible on satellite imagery. Lokon-Empung remained at Alert Level 2. During 10-16 March, volcanism remained at relatively high levels at Lokon-Empung with "white-thick ash emissions" rising to low levels above Tompaluan crater. No explosions occurred during 14-16 March. Seismicity was dominated by emission and tremor earthquakes. The Alert Level at Lokon-Empung remained at 3 (on a scale of 1-4). Explosive activity continued at Lokon-Empung during 24 February to 2 March, with 12 explosions producing "white-gray ash columns" that rose 300 m above the volcano. An explosion on 2 March at 2129 was preceded by 204 shallow and 77 deep volcanic earthquakes. During the explosion a "gray-dark ash column" rose 1.5 km above the crater, but incandescent volcanic material remained within the crater. Ash drifted about 14.5 km from the crater to the Tondano area, depositing ~1 mm of ash. Tremor was recorded after the eruption. Lokon-Empung remained at Alert Level 3 (on a scale of 1-4). An eruption at Lokon-Empung on 23 February around 1100 produced an ash cloud that rose 2.5 km above the crater. According to news reports, ash fell in the villages of Kinilouw and Kakaskasen and the Tondano Lake. On the 24th authorities put residents near the volcano on alert and banned recreational activities on Lokon-Empung's flanks. Two small eruptions on the 24th sent ash 200 m above the volcano. Lokon-Empung was at Alert Level 3 (on a scale of 1-4). On 10 February at 2219 an ash explosion occurred at Lokon-Empung, but the height of the resultant ash cloud could not be determined due to heavy rain. On 12 February, mainly during 0100-1000, there was a significant increase in volcanic earthquakes. At 1048 an explosion occurred, followed by seismic data indicating a larger explosion at 1102. On 12 February during 0800-1100 the Alert Level was raised from 3 to 4 (the highest level). Tremor was continuously recorded during 1255 on the 12th to 0046 the following day. According to the Darwin VAAC, an explosion occurred on 19 February at 0403 that produced a plume to 500 m above the summit. Starting at the beginning of the report week (3-9 February), there was an increase in seismicity and surface activity at Lokon-Empung in comparison to the previous week. There were more emission, and deep and shallow volcanic earthquakes and ash emissions. On 8 February at 0443 an ash explosion was accompanied by the ejection of incandescent volcanic material. A thick ash cloud rose to 1.4 km over the crater and 0.5-1 mm of ash was deposited S of the volcano in the villages of Kayau, Tara-tara I and II, and Woloan II and III. At this time the Alert Level was raised from 2 to 3 (on a scale of 1-4). Seismic and volcanic activity continued at high levels at Lokon-Empung during 27 May-2 June. Volcanic tremor occurred and thin emissions rose to low-levels above the crater. The volcano remained at Alert Level 3 (on a scale of 1-4). Seismicity at Lokon-Empung during 22 April-26 May remained above background levels. Several deep and shallow volcanic, tectonic, and small explosion earthquakes occurred. Thin, white plumes rose 50-250 m above the crater rim. Lokon-Empung remained at Alert Level 3 (on a scale of 1-4). Activity at Lokon remained higher than normal during 15-21 April. Volcanic tremor was high, gas explosions occurred at the bottom of the crater, and a low-level steam plume was visible. The volcano remained at Alert Level 3 (on a scale of 1-4). Increases in volcanic and seismic activity at Lokon-Empung led VSI to raise the Alert Level from 2 to 3 (on a scale of 1-4) on 12 April. Eruptions occurred on 10 April at 2302 and on the 12th at 1816. On 13 April eight gas-and-ash explosions occurred and on the 14th five occurred. Tremor that began on 11 April continued through at least the 14th. VSI reported that an eruption occurred at Lokon-Empung's Tompaluan crater on 10 April at 1104. The dark plume rose about 1 km above the volcano and tephra fell around the crater. Based on a pilot report, the Darwin VAAC first erroneously attributed the ash cloud to an eruption from Mahawu. No ash was visible on satellite imagery. After an eruption on 9 February, volcanism decreased at Lokon-Empung through at least the 17th. During 11-17 February, observers saw small volcanic plumes rise 50-150 m above the crater rim. The volcano remained at Alert Level 2 (on a scale of 1-4). Following a tectonic earthquake near Lokon on 19 October, activity increased at the volcano; high-frequency tremor occurred and gray emissions rose 50-250 m above Tompaluan crater. While fewer earthquakes were recorded during 12-18 November (10 per day) in comparison to the previous week (19 per day), the number of earthquakes was still above normal levels. No major changes in volcanic activity were seen at Lokon's summit. The Alert Level at Lokon remained at 2 (on a scale of 1-4). On 18 August at 2230 an explosion produced an ash cloud that rose ~800 m above the crater and drifted over the town of Manado 25 km N of the volcano. Following the explosion there was a significant increase in volcanic earthquakes in comparison to the previous week. The volcano remained at Alert Level 2 (on a scale of 1-4). VSI reported that there was a significant decrease in seismic activity at Lokon during 30 July-12 August in comparison to during previous weeks. Small explosions at Tompaluan crater produced plumes that rose 25-250 m above the summit. The volcano remained at Alert Level 2 (on a scale of 1-4). An article in the Jakarta Post stated that an eruption at Lokon that began at 2014 on 20 May deposited ash in a wide area around the volcano, including the provincial capital of Manado, approximately 20 km NE of the volcano. They reported that ash rose up to 900 m above the volcano and that the eruption was accompanied by tremor. Activity continued after the 28 January 2001 explosion. On 26 March 2001 at 1440 another eruption sent a dark ash plume 1,500 m above the crater rim. Ash drifted E and N. No incandescent material was observed, but 25 minutes after the explosion ash started to fall at Kinilow village (3.5 km from the crater) and Kakaskasen village (4 km from the crater). Activity slowly decreased though 1510, when thick white gas emissions from the crater rose 400 m. The ashfall was 0.3-0.5 cm thick at Kinilow village, 0.1-0.3 cm thick at Kakaskasen village, and 1-2 cm thick around Pasahapen river, about 1 km from the crater. After the initial explosion, volcanic tremor was recorded between 1442 and 1457 with a maximum amplitude of 2-16 mm. The seismograph recorded 13 deep volcanic (type A) and 12 shallow volcanic (type B) events on 25 March; six deep and seven shallow volcanic earthquakes were detected on the 26th. The VSI reported that following the 28 January eruption, activity decreased at Lokon-Empung with only small steam emissions occurring. A small tectonic earthquake (M 1) was reported in the area. The volcano remained at Alert Level 3 (on a scale of 1-4). Visual observations by VSI personnel during 12-17 February revealed that volcanic activity remained low at Lokon, with steam plumes rising 200-350 m above the crater rim. Seismic data were not available because the seismograph on the volcano was broken. The volcano remained at Alert Level 3 (on a scale of 1-4). After explosions occurred on 28 January, volcanic activity decreased. During 30 January to 5 February an ash plume was observed rising 200-350 m above the volcano. The seismograph on the volcano broke on 30 January. The volcano remained at Alert Level 3 (on a scale of 1-4). The VSI reported that volcanic activity increased in comparison to the previous week. Explosions began occurring at 1920 on 28 January and produced glowing ejecta (volcanic bombs) that fell on the N slope of the volcano. The height of the ash cloud that was produced by the eruption could not be measured due to unfavorable weather conditions. A strong sulfurous smell was detected from Kakaskasen observatory. On the morning of 29 January an ash plume rose continuously up to 300 m above the crater. The Alert Level at the volcano was raised during the report period from level 2 to 3 (on a scale of 1-4). Mt. Lokon began an eruptive phase at 0010 local time 27 November 1969, when a sudden explosion sent a thick, dark eruption cloud to a height of 500 m, and incandescent rocks were ejected, subsequently falling back around the crater. Three earthquakes were recorded. On 28 November an explosion at 2157 sent a cloud 400 m high, and pyroclastics were ejected for 15 minutes. Sulfurous smelling mud and sand fell in Kakaskasen, Kinilow, and Tinoor, causing leaves to wither and fish to die in some ponds. Fire was observed at several spots near the crater. By 2300 the activity was limited to bubbling crater water and a white eruption cloud. Between 1 and 9 December there were several explosions, usually accompanied by dark eruption clouds and light ash falls. Until the middle of December small-scale eruptions often took place at 20-minute intervals, accompanied by light ashfalls around Kakaskasen village. During the last half of December, the eruption became stronger, and violent explosions on 23 and 25 December resulted in mud rains and ashfalls. In addition, 16 moderate eruptions occurred in the last half of the month, pushing ash columns 300 m above the crater. Information Contacts: Djajadi Hadikusumo, Chief, Volcanology Division, Geology Survey of Indonesia, Bandung, Indonesia. "Activity began 22 March at 0336 with a small phreatic eruption from the Tompaluan Crater . . . . A small (700,000 m3) crater lake within Tompaluan crater was ~60% evacuated during the 22 March eruption. A larger, phreatomagmatic eruption occurred on 24 March at 0343, emptying the remainder of the lake and throwing out incandescent ballistic blocks to heights of 800-1,000 m. Mudflows were produced during both eruptions. No casualties or damage have been reported. Small explosions occurred on 29 March at 1547 to 250 m height, at 1806 to 300 m, and at 1817 to 200 m. The VSI observation post is located at Kakaskasen, ~5 km SE of the volcano. The observatory has one vertical component seismometer, located at Lokon." Information Contacts: Suratman, A. Sudradjat and T. Casadevall, VSI. "On 5, 7, 12, and 27 April, small explosions were observed from Tompaluan Crater. The maximum height of the explosion clouds was 500 m."
A small explosion 2 June at 0730 ejected a gray plume to ~700 m above the crater. No other activity had been reported since a phreatic explosion on 27 April. Through July, as many as several small explosions/day continued to send ash clouds to 300-500 m above the crater. The lake within Tompaluan Crater has disappeared completely. "Explosions continued almost daily through September, ejecting tephra that contained juvenile ballistic fragments (breadcrust bombs) to several hundred meters above the vent on 4, 9, and 11 September." Phreatic explosions continued through October. No lava flow has been observed. No juvenile material has been reported since breadcrust bombs were ejected in early September. Information Contacts: Suratman and T. Casadevall, VSI. Approximately 100 explosions occurred at Tompaluan Crater in November, with ~20 recorded 21-27 November, and 33 the previous week. The strongest, on 22 November at 1921, ejected lava fragments and incandescent bombs that fell within 400 m of the crater in the S summit area. An ash column rose 1,000 m and ashfall occurred over a wide area to the SE. Less than 0.5 mm of ash fell at the Kakaskasen Volcano Observatory, ~5.5 km SE of the crater. No casualties or crop damages were reported. The Observatory recorded 37 volcanic earthquakes during November. Explosions from Tompaluan Crater continued through early January at rates of 30-80/day. Maximum plume heights were 500-800 m. The Kakaskasen Volcano Observatory recorded 2-20 volcanic earthquakes/day; the average number of events was ~10/day. Lokon-Empung was relatively quiet during March, with only a single gas explosion, on 11 March at 0340, which produced a plume to 900 m height. Normal activity consisted of a white gas plume continuously emitted to a maximum of 300 m above Tompaluan crater. Information Contacts: VSI; T. Casadevall, USGS & VSI. Activity diminished during April. A white plume was continuously emitted from Tompaluan Crater to heights of 200-400 m. During the first half of the month, an average of 15 tectonic earthquakes were detected daily. No seismic activity was reported for the second half of the month. 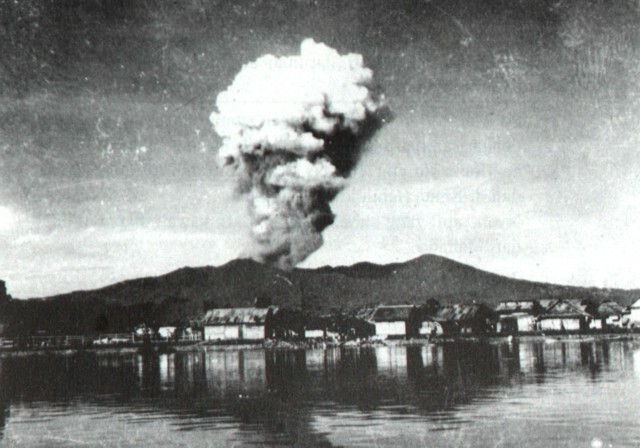 Lokon-Empung generally remained quiet during May and June, with only two ash explosions, on 10 and 13 May. Ash columns rose ~750 m above Tompaluan Crater. Explosions began in March 1986, but have been infrequent for the last few months. A single explosion occurred on 21 April at 0600. The plume reached 400 m above the crater. Gas emissions to 450 m height were observed during the morning and afternoon of 10 May. One week later (17-18 May), ash was erupted to 200-400 m height. Seismicity then decreased, with one deep and three shallow volcanic earthquakes recorded during the last week of May, down from six deep and nine shallow events the second week of the month. Ash explosions occurred at 1537 on 27 May and 1000 on 28 May, producing columns 250 m high. Continued ash explosions were observed at a rate of 7-16/week, with column heights of 200-400 m. Seismic activity was characterized by explosion earthquakes, averaging 30-50 recorded events/week. Shallow and deep volcanic earthquakes were less frequent (2-8 and 3-9 events/week, respectively). Tectonic earthquakes ranged from 18 to 101 weekly. The press reported that renewed activity on 19 September ejected a plume to ~700 m. Incandescent tephra fell 500 m from the crater, starting fires that burned plantations in seven villages. No casualties were reported. As of the next morning, the eruption was continuing and VSI observers were recording accompanying earthquakes. VSI advised local authorities that residents of nearby villages should remain on alert, but an evacuation was not ordered. Vigorous explosions on 24 October ejected ash to ~2 km height, and may have generated a pyroclastic flow on 25 October, before a decline in activity noted at 2000. As much as 1 m of tephra was reportedly deposited near the summit, but only 2.5 cm of ash fell 4 km E (at Kinilaw). The airport at Manado (15 km NE; figure 1) was closed until 29 October, because of poor visibility and minor ashfall. By 29 October, more than 1900 buildings and roughly 3 km2 of clove trees and coconut palms had been damaged; ~10,000 people were evacuated. Ash and incandescent material ejected on 6 November reached 300 m height. Large explosions on 17 and 20 November produced ash columns 1,000 and 2,500 m high, respectively, panicking residents of nearby villages, who had recently returned to their homes. Ash emissions continued the next day, but were less frequent and less intense. Vivianne Clavel, a Swiss volcanologist studying the eruption, was reported missing on 24 October, and had not been located by searchparties at press time. Figure 1. Map of Lokon-Empung, based on a portion of the Manado, Indonesia 1:250,000 sheet (Joint Operations Graphic-Ground, series 1501, sheet NA 51-12, Army Map Service, Washington). Contour interval, 200 m.
Information Contacts: N. MacLeod, Ridgefield WA, USA; T. Casadevall, USGS; U.S. Embassy, Jakarta; UPI; Reuters; AP. Since the end of the vigorous activity that began on 24 October, 16 explosions from the active Tompaluan Crater have been recorded (figure 2). Ash column heights ranged from 200 m to >250 m above the rim of Tompaluan . . . . The most recent recorded explosion, on 1 December at 1717, was preceded by tremor that morning and the previous day. The press described an apparently unrecorded ash emission episode that produced a 300-m plume during the morning of 11 December. Gas rose to 200-300 m height between explosions. Local seismicity continued at somewhat reduced rates (figure 3). Figure 2. Number of recorded explosions/day at Lokon-Empung, 24 October-12 December 1991. Courtesy of VSI. Figure 3. Number of recorded earthquakes at Lokon-Empung, 28 October-12 December 1991. For each day, three bars are shown, distinguishing shallow volcanic earthquakes (left), deep volcanic shocks (center), and tectonic events (right). Arrows indicate tremor episodes. Courtesy of VSI. VSI warned that additional explosions were still anticipated, and the area designated by their 1986 hazard map remained at risk. The press reported that [~10,000] people had fled the 24 October activity, but most had returned home by early December. 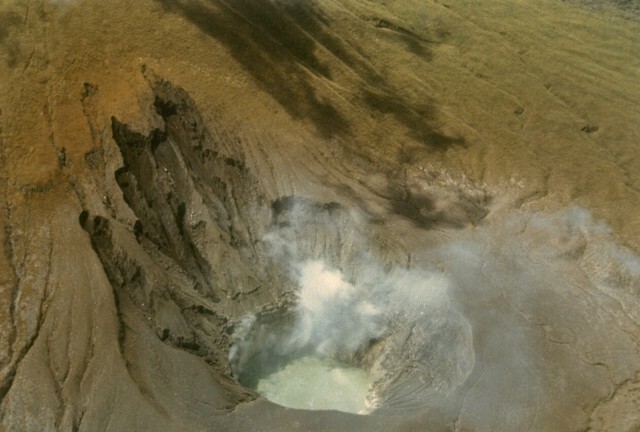 "During our visit to the summit zone on 8 July, intense fumaroles escaped from several parts of the Tompaluan crater floor. This fumarolic activity was mainly concentrated in the N where an intracaldera structure was covered by yellow sulfur deposits. Many other fumaroles with sulfur deposits were also located in the S, E, and W parts of the crater. Temperatures measured with an electronic thermometer at the E fumaroles showed a maximum value of 95-96°C. The fumarolic gases were mainly composed of H2O and H2S." Information Contacts: H. Gaudru, C. Pittet, M. Auber, C. Bopp, and O. Saudan, EVS, Switzerland. Vapor emission was observed during November-December 1995 and whitish-gray plumes rose to 100 m above the active crater. Seismicity during September-October 1995 consisted of 1- 8 A-type events/day. On 1 November there were 46 A-type events recorded, followed by very low seismicity over the next ten days. Activity then increased from 12 November through 31 December, but was highly variable with 4-21 events/day. B-type events remained at 0-8 events/day. The present activity is located at Tompaluan crater, in the saddle between the peaks of Lokon (1,579 m) and Empung (1,340 m). About 10,000 people evacuated following an explosion in October 1991 accompanied by a pyroclastic flow; the eruption ended in January 1992. Information Contacts: Wimpy S. Tjetjep (Director), Volcanological Survey of Indonesia (VSI), Jalan Diponegoro 57, Bandung, Indonesia. During October, Tampoluan crater emitted white vapor up to 50-75 m high. Occasionally, strong sulfuric gases were smelled at the observatory an undisclosed distance away. Volcanic earthquakes tended to increase but activity remained at a low level. A slight increase in shallow volcanic seismic activity was recorded in late June lasting through August, although there was a minor decrease in July. Observers saw a plume of white vapor rising 25-75 m above the summit. During 9 March-24 May visual observations suggested stable conditions, with a "white ash plume" rising 25-75 m above the crater rim. But the seismic record showed extreme variation. Between 9 March and 23 March, volcanic A-type events increased from 7 to 53 and volcanic B-type events rose from 15 to 64. Tectonic events decreased from 34 to 17 in that same period. During the week of 23-29 March event numbers dropped to 23 for A-type and 43 for B-type. Tectonic events rose to 35. Weekly event incidence declined in May, hovering under 10 for A-type, under 20 for B-type, and under 25 for tectonic. This report covers activity during March-October 2000. Visual and seismic activity increased notably in mid-March, and the alert level for Lokon-Empung was set at 2 on a scale of 1-4. A very dense gas emission caused vegetation on the eastern slope to wither. During this period, 45 deep volcanic (A-type) earthquakes, 210 shallow volcanic (B-type) earthquakes, and 12 tectonic earthquakes occurred. Tompaluan crater emitted white medium-dense gas that rose 50-150 m above the crater rim in late March. Seismicity changed, with fewer volcanic and more tectonic earthquakes than in the previous weeks. At the beginning of April, the number of A-type earthquakes increased, but visual activity remained similar to the previous week. The white medium-dense gas emission from Tompaluan crater increased in height to 50-200 m above the rim in the second week of April. B-type earthquakes still dominated seismicity. Seismic intensity of B-type earthquakes increased toward the end of April. Gas emission remained similar, but decreased in height to 50-150 m above the crater rim. During the second week in May, an ash plume rose 100 m above the rim of Tompaluan crater. A volcanic ash advisory was issued on 15 May to warn aviators of the ash cloud emanating from Lokon-Empung. The advisory indicated ash at an altitude of 3,000 m with the potential to rise to 5,600 m and drift to the W. In mid-May, ash explosions increased, sending a white medium-thick plume to 50-200 m above the crater rim. Seismicity peaked with 228 A-type events, 247 B-type events, and 46 tectonic events. Activity reports did not resume until mid-June, when little visual change took place and seismicity decreased. By the end of June, the white ash plume reached up to 250 m in height, and volcanic earthquakes still dominated the seismicity. White, thin ash explosions reached up to 300 m above the crater rim in late July. Kakaskasen Post Observatory reported a red illumination at the summit, and subsequent observations suggested the operative phenomenon was lava fountaining. The number of volcanic earthquakes decreased, but continuous tremor initiated with amplitudes ranging from 0.5 to 26 mm. The alert level for Lokon-Empung was raised from 2 to 3. Activity remained similar during 31 July-7 August. White variably dense ash clouds continued to rise to heights of up to 300 m, and lava fountaining up to 25 m above Tompaluan crater was visible during the first week of August. Tectonic earthquakes became dominant, and the amplitude of volcanic tremor reached 0.5 mm. Ash plumes rose to 500 m above the crater rim, and lava fountaining persisted in mid-August. Continuous tremor had amplitudes of 0.5-1 mm. The ash plumes decreased in height to 300 m above the crater the following week. A volcanic ash advisory was issued on 15 August for aviators in the vicinity of Lokon. The number of volcanic earthquakes increased slightly, and tremor decreased in amplitude to 0.5 mm. Activity increased slightly in September. The ash plume reached progressively higher, ranging from 50 m to 350 m and eventually up to 400 m. Continuous tremor amplitude increased to 0.5-1 mm. Few volcanic earthquakes occurred, so tectonic earthquakes were dominant. The alert level for Lokon-Empung was decreased from 3 to 2 in early October, and activity decreased during the month. The white variably dense ash plume decreased in height to 250 m, although lava fountaining remained visible at a consistent height of 25 m. Seismicity also decreased, and tremor ceased by the end of October. Information Contacts: Dali Ahmad, Volcanological Survey of Indonesia (VSI), Jalan Diponegoro No. 57, Bandung 40122, Indonesia (URL: http://www.vsi.esdm.go.id/); Darwin Volcanic Ash Advisory Centre (VAAC), Bureau of Meteorology, Northern Territory Regional Office, PO Box 40050, Casuarina, NT 0811, Australia (URL: http://www.bom.gov.au/info/vaac/). A white, low-density plume rose 50-200 m above Lokon's summit during 2-8 January 2001. Seismographs recorded a high number (~250) of both deep and shallow volcanic earthquakes during the week. The following week a plume continued to rise, and volcanic earthquakes decreased in number by about 90%. Discontinuous tremor with amplitudes of 0.5-6.0 mm was registered. During 16-22 January the plume rose up to 250 m in height. Volcanic earthquake activity again spiked, but reached only about half the quantity that had occurred during the first week of the month. Discontinuous tremor continued having amplitudes of 0.5-2.6 mm. An explosion sent ash and glowing ejecta skyward from Lokon at 1920 on 28 January. Explosion earthquakes registered a maximum amplitude of 48 mm during a 175-second interval. Volcanic bombs were ejected from the crater and fell on Lokon's N slope. The ash cloud's specifics could not be measured due to rainy weather. Workers at the Kakaskasen observatory post detected an acrid sulfurous smell following the explosion. Observations the following day, 29 January, revealed a light-colored, high-density ash plume that rose ~300 m. The hazard status for Lokon was raised from 2 to 3 (on a scale of 1-4) following the explosion. Early February activity showed a decrease in unrest, although a high-density plume continued to rise up to 350 m, and small explosion earthquakes with amplitudes of 20-30 mm recurred. During February through at least 2 December 2001 at Lokon-Empung, seismic activity varied, three eruptions occurred, and plumes were observed rising 25-1,500 m above the summit (table 1). The volcano was at Alert Level 3 (on a scale of 1-4) until the week of 27 February - 5 March, when it was decreased to 2, remaining there through at least 2 December. Table 1. Summary of seismicity and character of plumes at Lokon-Empung during February to 2 December 2001. At times, seismic data were not available because of a broken seismograph. During March, there were 13 deep and 12 shallow volcanic events on the 25th; there were 6 deep and 7 shallow volcanic events on the 26th. Courtesy of VSI. Feb 2001 -- -- 1 (M 1) -- 50-350 m Thin-to-thick white plumes. Mar 2001 21 19 32 5 minutes (2-16 mm amplitude) 25-1,500 m Thin white plumes; 26 March explosion yielded dark ash plume, ashfall. Apr 2001 4 2 114 Four episodes 40-300 m Thin white plume. May 2001 92 218 124 Discontinuous (0.5-7 mm amplitude) 50-900 m White plumes; explosion on 20 May and gray-black plume drifting N.
Jun 2001 20 20 96 Discontinuous 25-300 m White plumes. Jul 2001 162 263 134 Discontinuous (0.5-8 mm amplitude) 25-200 m White plumes. Aug 2001 57 261 45 Discontinuous (0.5-1 mm amplitude) 25-270 m Thin white plume; 18 August explosion with ashfall. Sep 2001 132 112 156 Discontinuous 25-250 m Thin white plumes. Oct 2001 48 165 82 Discontinuous 50-250 m White and gray plumes. Nov-2 Dec 2001 184 113 67 Discontinuous 50-250 m White to gray plumes. Immediately following the 28 January eruption (BGVN 26:01), activity decreased. An M 1 tectonic earthquake was registered the week of 20-26 February. On 26 March at 1440 an eruption sent a dark ash plume 1,500 m above the crater rim that drifted E and N. No incandescent material was observed, but 25 minutes after the explosion ash started to fall at Kinilow and Kakaskasen villages (3.5 and 4 km from the crater, respectively). Activity slowly decreased though 1510, when thick white gas emissions rose 400 m above the crater. The ashfall was 0.3-0.5 cm thick at Kinilow, 0.1-0.3 cm thick at Kakaskasen, and 1-2 cm thick around the Pasahapen River ~1 km from the crater. After the initial explosion, volcanic tremor recorded between 1442 and 1457 had a maximum amplitude of 2-16 mm. Another eruption began at 2014 on 20 May, ejecting glowing material that rose as high as 400 m and then fell around the crater. The explosion produced a gray-black plume that rose to 900 m and drifted N. At 1510, a thick-white plume reached 400 m above the summit. Based on field observations, 1-2 mm of ash was deposited in a wide area around the volcano, including Pineleng village and the provincial capital of Manado (25 km N of the volcano). In anticipation of the eruption, the Volcanological Survey of Indonesia (VSI) coordinated with local government agencies, contacted the Sam Ratulangi and Cengkareng airports, and warned people living around the volcano. During early July, instrumental monitoring showed increased activity, based on the high number of shallow volcanic earthquakes. During 30 July-12 August seismic activity decreased. Small explosions produced plumes that rose 25-250 m above the summit. On 18 August at 2230 an explosion produced an ash cloud that rose ~800 m above the crater and drifted over N Manado. Based on visual observations, activity did not change significantly after the explosion, but the seismicity showed a major increase. Deep and shallow volcanic earthquakes averaged 8 events per day, higher than the normal average of about 5 events per day. During July to August, seismicity decreased to nearly normal levels. During mid-October, seismicity increased again. On 19 October an M 1 tectonic earthquake was registered, and the number of volcanic earthquakes increased significantly, followed by an interval of high-frequency tremor. Seismicity continued to increase through mid-November, to an average of 19 events per day. During the week 12-18 November, seismicity began to decrease again but still remained higher than normal, at about 10 events per day. Seismicity continued to decrease through November, and by 2 December had returned to normal levels. Information Contacts: Dali Ahmad, Volcanological Survey of Indonesia (VSI), Jalan Diponegoro No.57, Bandung 40122, Indonesia (URL: http://www.vsi.esdm.go.id/). After an explosion at Lokon on 28 January 2001 (BGVN 26:01), the hazard status was raised from 2 to 3 (on a scale of 1-4). During the following two months activity continued but decreased and the hazard status was reduced to 2. Then, at 1440 on 26 March, Lokon exploded again, producing dark ash that rose 1.5 km above the crater rim and drifted E and N. The explosion did not produce any incandescent material. Ash began falling on Kinilow (3.5 km from the crater) and Kakaskasen villages (4 km from the crater) 25 minutes later, eventually reaching a thickness of 1-2 cm near Pasahapen river (~1 km away). Tremor shortly after the explosion had a maximum amplitude of 2-16 mm. During April and May there were occasional tremor earthquakes with amplitudes of ~0.5-1 mm. White, medium-thick plumes from Tompaluan crater were observed from the Kakaskasen observatory. An explosion from Tompaluan at 2014 on 20 May produced a grey-black plume 900 m high that drifted N. The plume was accompanied by glowing ejecta to a height of 400 m. Subsequently, activity fluctuated and white, medium-thick plumes ~50-250 m high were visible from the observatory. At 2230 on 18 August an explosion produced ash that reached 800 m above the crater rim and spread 25 km N to Manado. Seismicity increased significantly shortly after the explosion, then returned to periods of varying intensity during the following months. An M 1 tectonic earthquake on 19 October was followed by periods of high-frequency tremor. Gray plumes rose 50-200 m above the Tompaluan crater. These conditions continued until 25 October. The significant increase in seismic activity and the changing color of the plume signaled a need for intensive monitoring in anticipation of probable higher activity levels. Increased levels continued until early December when activity decreased and the hazard level was lowered to 1. The hazard level was again raised to 2 after an eruption on 9 February 2002. Plumes rose to 1.0 km and moved toward the SE, depositing ash (~0.5-2 mm thick) around the villages of Kakaskasen III, Talete I, Talete II, and Rurukan. The phreatic eruption was triggered by extensive rainfall; specifically, 602 mm of rain fell during January 2002 compared to 193 mm during December 2001. This excessive rainfall was thought to cause instability of the edifice. After the eruption, activity decreased significantly and remained low through at least February 2002. An eruption at Lokon on 9 February, triggered by extensive rainfall, sent ash plumes to 1 km and deposited ash in surrounding villages. Activity then decreased significantly and remained low through February 2002 (BGVN 27:02). During February through at least April, Tompaluan crater emitted plumes 50-350 m above the crater rim. During early April deep and shallow volcanic earthquakes increased (table 2). Eruptions on 10 and 12 April ejected glowing material from the crater. A thick white-gray ash plume rose 1 km above the crater rim. During 13-14 April gas/ash explosions occurred nearly continuously, with eight explosions on 13 April and five on the 14th. Ash explosions rose 50-75 m above the crater rim. Tremor amplitude increased from 0.5-2 mm on 11 April to 4-48 mm by 14 April. The Volcanological Survey of Indonesia (VSI) raised the Alert Level to 3 on 12 April. A total of 25 and 68 small explosions per week were registered during 22-28 April and 29 April-5 May, respectively. During the following weeks the number of small explosions dropped to only 6 per week. As of 26 May, tremor fluctuated (0.5-30 mm amplitude) and gas explosions continued. Table 2. Earthquakes recorded at Lokon during 11 February through 26 May 2002. Courtesy VSI. During 27 May-4 August 2002, activity was higher than normal at Lokon. Volcanic and tectonic earthquakes dominated the seismicity (table 3). Generally thin white plumes, reported as "ash plumes" after 1 July, were reaching 25-150 m above the crater rim. Tremor amplitude was 0.5-1 mm during 27 May-2 June. The Alert Level was decreased from 3 to 2 during early June and remained at 2 throughout the report period. Table 3. Earthquakes occurring at Lokon during 3 June-4 August 2002. Courtesy VSI. Higher-than-normal activity continued at Lokon-Empung during August-December 2002. Throughout the report period a "white-thin ash plume" rose 25-75 m above the crater rim. No ashfall was reported. Seismicity was dominated by shallow volcanic and tectonic earthquakes (table 4). Table 4. Earthquakes recorded at Lokon during 5 August-29 December 2002. No reports were issued during 11 November-22 December. Courtesy VSI. During the week of 4-10 November, the hazard status was reduced from Alert Level 2 to 1 (on a scale of 1-4). On 23 December a "white-thick ash plume" rose 100-250 m over Tompaluan crater. No ashfall was reported. [A later report did note ashfall.] The same day, volcanic tremor with an amplitude of 0.5-2 mm occurred. A total of 42 emissions were reported during 23-29 December. The Alert Level returned to 2 by the end of the report period. During 6 January-4 May 2003, higher-than-normal activity was dominated by deep and shallow volcanic earthquakes (table 5), along with gas-and-ash emissions. Several explosions occurred during a period of increased activity in late January-early April. Throughout the report period, a "white-thick ash" emission rose 25-500 m above Tompaluan crater. The Volcanological Survey of Indonesia (VSI) issued a special report during 1-13 February 2003 that described activity in 2002 and early 2003 leading up to the recent increase in activity (table 6). Table 5. Seismicity at Lokon during 6 January-4 May 2003. Courtesy VSI. Table 6. Summary of a special report of activity at Lokon during 2002-2003. Courtesy VSI. 09 Feb 2002 An explosion ejected ash to ~ 1,000 m above the crater. Ash fell on Kakaskasen, Telete, and Rurukan villages in the Tondano District in thicknesses of 0.5-2 cm. 10 Apr 2002 At 2302 volcanic earthquakes began to increase, reaching a total of 184 events. An explosion at the same time ejected ash to ~ 1,000 m and glowing material to 250 m above the crater. Ash fell on some villages in thicknesses of 1-3 mm. 12 Apr 2002 At 1816 an explosion ejected ash to 800 m and glowing material to 150 m. Ash drifted S and fell around Kayawu village. 23 Dec 2002 At 0532 an explosion at Tompaluan crater produced an 800-m-high ash column. Ash drifted S and fell around the edifice. Before the explosion, an increase in seismicity (130 volcanic earthquakes in less than 12 hours) was noted. 03 Feb 2003 Volcanic earthquakes began to increase, with a total of 255 events occurring through 7 February. 08 Feb 2003 Tremor was followed by an explosion at 0443 that ejected ash to 1,400 m above the crater. The ash drifted S and was accompanied by glowing material. Ash fell around Taratara, Waloan, and Kayawu villages, at thicknesses of 0.5-1 cm. 10 Feb 2003 After two days repose, at 2219 an explosion occurred. The height of the ash column could not be observed due to heavy rain near the summit. The explosion was preceded by a booming sound. Based on seismograph recordings, the explosion was of medium-high intensity. Explosion earthquakes stopped at 2335. A phreatic eruption at 1406 lasted for 8 minutes. 12 Feb 2003 A significant increase in volcanic earthquakes, mainly during 0100-1000. An explosion at 1408 was followed by a larger explosion at 1102 (based on seismic data; visual observation obscured by thick fog). At 1133 the explosion diminished. At 1225 continuous tremor began with amplitudes of 13-55 mm that continued until 0046 on 13 February. On 25 January, there was a felt shock (I on the MMI scale). During late January, ash emissions from the crater thickened and emission earthquakes increased. On 3 February the number of deep volcanic earthquakes began to increase at 0600; by 1000, 35 had occurred. Ash emissions continued to thicken and deep and shallow volcanic earthquakes increased during early February. Emission earthquakes also increased, indicating some low ash explosions. On 8 February at 0443 an explosion ejected ash and glowing material. A booming sound was heard for 30 seconds. A dense ash cloud reached 1,400 m above the crater. Ash fell over the S part of the crater and around Kayau, Tara-tara I and II, and Woloan II and III villages. Ashfall reached thicknesses of 0.5-1 mm. The Alert Level was increased from 2 to 3 (on a scale of 1-4). Explosions occurred on 10 February at 1405 and 2219. The maximum amplitude of the explosion earthquakes was 50 mm. The height of the ash column could not be observed due to heavy rain. Explosion activity continued on 12 and 16 February. VSI reported that the Alert Level was increased to 4 on 12 February at 0800. From that time through 1100 on 12 February, shallow volcanic earthquakes increased to a total of 164. An explosion followed at 1102, but the ash column could not be observed due to heavy rain. Tremor was recorded beginning on 13 February with amplitudes of 0.5-38 mm. VSI reported that during 18-20 February, there were 16 explosions and a "white-gray ash" column rose 500 m. An explosion on 22 February was preceded by a swarm of 224 shallow volcanic earthquakes. On 21 February, 29 deep volcanic earthquakes occurred. Within two days, the number of volcanic earthquakes decreased gradually and ended with a large explosion on 23 February at 1034. The explosion was accompanied by thundering and a booming sound, and a "thick-gray ash" column reached 2,500 m above the crater. Ash drifted toward the SE. Tremor (with an amplitude of 1-20 mm) began soon after the explosion. Lokon was at Alert Level 3 during 17-23 February. During 24 February-2 March, 12 explosions occurred and a "white-gray ash" column rose 300 m. An explosion on 2 March at 2129 was accompanied by glowing material that fell within the crater. A dark gray ash column rose 1,500 m above the crater and ash fell toward the Tondano area (~14.5 km from the crater) with a thickness of ~1 mm. Tremor (with amplitudes of 0.5-25 mm) began soon after the explosion. The explosion had been preceded by a swarm of 204 shallow volcanic earthquakes. A total of 77 deep volcanic earthquakes occurred during 26 February-1 March 2003. Following the 2 March explosion, there were 2 medium-intensity explosions that produced a ~600-m-high "white-gray ash" column. Ash explosions and emission earthquakes ended on 14 March. On 24 March, the Alert Level was lowered to 2. Normal activity continued, comprised mainly of "white-thick ash" emissions from Tompaluan crater that reached up to 300 m. Tremor continued with amplitudes of 0.5-12 mm. On 27 March at 0156, an explosion produced a 1,500-m-high ash column that was accompanied by glowing material. Booming and blasting sounds were heard. Ash drifted S and some fell around the edifice, while glowing material reached 400 m high before falling around the crater. Activity was low after the explosion. Tremor continued with amplitudes of 0.5-24 mm. Following another explosion on 1 April, activity at Lokon decreased. A "white-thick ash" plume continued to rise 100-450 m above the crater. Seismicity was dominated by tremor with amplitudes of 0.5-25 mm. Shallow volcanic earthquakes increased on 15 April to 106 events. Through 20 April, the daily number of shallow volcanic earthquakes fluctuated between 23 and 56 events, but there were no explosions. Activity remained low, but above normal, through at least 4 May. The hazard status at Lokon-Empung throughout the report period of 2 June-19 October was at Alert Level 2 (on a scale of 1-4). Between 2 June and 5 October a white gas plume consistently rose 25-50 m above Tompaluan crater. The gas plume rose slightly higher, to 75 m, during the following two weeks. Seismicity remained above normal background levels during this time, with some variation (table 7). Shallow volcanic earthquakes increased in late July, but by September the weekly count was lower than in early July, eventually reaching a low the week of 15-21 September when no such events were detected. Seismicity quickly returned to high values of 138-209 shallow events per week in October. Table 7. Seismicity at Lokon-Empung, 2 June-19 October 2003. Data was not available for 16-29 June and 04-31 August. Courtesy of VSI. Ongoing seismicity at Lokon was reported in BGVN 28:10. The Volcanological Survey of Indonesia (VSI) report for 27 October-30 November showed continuing seismicity (table 8), and a white gas plume rising 75-150 m from the Tompaluan crater. The volcano remained at alert level 2 (on a scale of 1-4). Table 8. Seismicity recorded at Lokon-Empung, 27 October-30 November 2003. Courtesy of VSI. Information Contacts: Dali Ahmad, Hetty Triastuty, Nia Haerani and Suswati, Vulcanological Survey of Indonesia (VSI), Jalan Diponegoro No. 57, Bandung 40122, Indonesia (URL: http://www.vsi.esdm.go.id/). The twin volcanoes of Lokon and Empung exhibited low levels of activity during 2005. Table 9 is a summary of reported gas emissions and number of volcanic earthquakes during 2005. Table 9. Summary of activity at Lokon-Empung during 2005, indicating the height and composition of plumes observed and the numbers of earthquakes recorded. Data courtesy of CVGHM. Information Contacts: Dali Ahmad, Hetty Triastuty, Nia Haerani and Suswati, Center of Volcanology and Geological Hazard Mitigation (CVGHM), Jalan Diponegoro 57, Bandung 40122, Indonesia (URL: http://www.vsi.esdm.go.id/). Our most recent report on Lokon-Empung discussed low seismicity and plume emissions between January-October 2005 (BGVN 31:03). Since then, available reports from the Center of Volcanology and Geological Hazard Mitigation (CVGHM) discussed seismic events in June and December 2007, and January 2008. Plumes mentioned in these reports were small, white in color, and only rose 15-40 m, occasionally up to 125 m, above the rim of the active vent area (Tompaluan crater), in the saddle between the peaks of Lokon and Empung. During 11-24 June 2007 CVGHM reported 52 A-type and 156 B-type earthquakes, but no tremor. Only one earthquake was felt by residents. The Alert Level remained at 2 (on a scale of 1-4). On 9 December 2007, CVGHM raised the Alert Level from 2 to 3 based on visual observations, inflation detected by deformation instruments, and an increase in seismicity. The water in the Tompaluan crater changed color from green to gray and noises from degassing became stronger. Visitors were advised not to go within 2 km of the crater. After a short period of decline, seismicity began to increase again on 22 January 2008, peaking on 3 February. Visitors were prohibited from going within 1 km of the crater. This report discusses Lokon-Empung during February to mid-July 2011. There were occasional modest ash-bearing eruptions and elevated seismicity through June. Stronger ash plumes during July spurred evacuations. Our previous report noted unrest during 2007 through March 2008 (BGVN 33:02). According to the Center of Volcanology and Geological Hazard Mitigation (CVGHM), since February 2008 through the reporting period, seismic activity was characterized by daily volcanic earthquakes and occasional phreatic eruptions when rainfall was high. According to CVGHM and news articles, on 22 February 2011, a phreatic eruption discharged from Tompaluan crater (figures 4 and 5). The eruption was possibly triggered by high rainfall. It produced an ash plume that rose 400 m above the crater rim and drifted SE. Figure 4. An index map and globe showing Indonesia and some neighboring countries. Note the location of Sulawesi island (Indonesia) and Lokon-Empung volcano. Courtesy of Relief Web. Figure 5. A 1982 sketch map looking from the N at the three main craters at Lokon-Empung. Note the middle crater (Tompaluan) is the one from which the current eruption is venting. This, multiple photos, and other information appears in the GVP's Photo Gallery associated with this volcano. The word "air" in the bottom of the crater means water in Indonesian; it refers to the shallow lake that periodically appears on the crater floor. Photo courtesy of the Volcanological Survey of Indonesia. CVGHM reported that, during 1-25 June 2011, white plumes rose 50-200 m above Tompaluan crater. On 26 June, a phreatic eruption ejected material that both fell around the crater and produced a gray plume that rose 400 m above the crater rim and drifted N. Seismicity increased the next day and white plumes rose 50-200 m above the crater. The Alert Level was raised to 3; prohibiting visitors and residents entering within a 3-km radius of the crater. According to CVGHM, during 28 June-9 July 2011 white plumes rose 50-400 m above Tompaluan crater and gray ash plumes rose 100-500 m above the crater. An ash eruption on 10 July 2011 produced white-to-gray plumes that rose 200-400 m above the crater. Fluctuations in the sulfur dioxide gas emission rate were noted during 30 June-10 July. Based on gas flux, seismicity, visual observations, and hazard assessment, CVGHM raised the Alert Level to 4. On 11 July, the Darwin Volcanic Ash Advisory Centre (VAAC) reported that ash plumes detected in satellite imagery rose to an altitude of 1.5 km and drifted NW. According to news articles, close to 1,000 residents were evacuated from the area during 11-12 July 2011. HOPE Worldwide, a non-profit non-governmental organization, issued a report on 15 July 2011 stating that at 2331 on the 14 July Lokon erupted and sent lava, ash, and gases 1.5 km over the summit. "No death is yet to be reported due to the eruption, but there are 4,412 persons displaced in the Tomohon city, just south of Manado city, the capital of North Sulawesi Province." Displaced residents went to schools and a city park. Figures 6-8 show photos of molten material and eruptions taken from various perspectives on 14 and 17 July. The photo shown as figure 8 accompanied another panoramic shot with the eruption. Figure 6. Lokon volcano photographed at night on 14 July 2011. Tompaluan crater contained a small lake and molten material appeared on the far crater side of the crater. Courtesy of the blog named 11reviews.blogspot.com. Figure 7. Lokon erupting late on 17 July 2011, spewing rocks, lava and ash hundreds of meters into the air. Courtesy of AFP. Figure 8. An eruption at Lokon seen across the water from distance (taken at 1100 on 17 July 2011). This photo was posted on the Flickr website. Copyrighted photo by Christian Loader (scubazooimages.com). A video posted on The Guardian website (on 15 July) shows people dispensing face masks to residents as ash from Lokon falls. The original video apparently came from Associated Press (2011; see Reference list). According to the news agency AFP, a small eruption—the largest since late June—lit up the night sky on 17 July, sending a large ash plume '3.5 km up into the sky.' A nearby airport was placed on alert, but as of 18 July flights were not affected. The article said that, since this latest (17 July) eruption, more than 5,200 residents had been evacuated. Other reports noted the number of displaced residents in the range 4,000-6,000. Reference. Associated Press, 2011, Indonesian volcano erupts, Thousands of residents evacuated from slopes of Mount Lokon in Sulawesi province (AP photo used in 15 July 2011 article on The Guardian.co.uk website) (URL: http://www.guardian.co.uk/world/2011/jul/15/indonesian-volcano-erupts). Lokon-Empung has been in a state of unrest since 2007 (BGVN 33:02). Between mid-February through mid-July 2011, occasional phreatic eruptions, modest ash plumes and elevated seismicity occurred, with a larger ash plume in July 2011 (BGVN 36:06). This report addresses seismic events from mid-July through 1 December 2011. According to the Center of Volcanology and Geological Hazard Mitigation (CVGHM), during 20-21 July 2011, seismicity and visual observations of Tompaluan crater in the saddle between the twin peaks of Lokon and Empung indicated that activity continued to be high. On 20 July plumes rose 100-500 m above Tompaluan crater, and during 21-24 July 2011 white plumes again rose 100-300 m. CVGHM noted that, since an eruption on 18 July, most data showed a decline in activity and therefore on 24 July the Alert Level was lowered to 3 (on a scale of 1-4). Residents and tourists were not permitted within 3 km of the crater. A news article (Straits Times) stated that on that same day about 5,000 residents that had evacuated returned home, and about 200 people remained in shelters. CVGHM reported that during 24 July-8 August 2011 seismicity decreased at Tompaluan crater, with a drastic reduction on 26 July. According to a news article (BNO News, accessed on Daijiworld News), during 27 July-8 August white plumes rose 100-400 m above the crater. The article stated that at the end of August, Tompaluan crater erupted several times (12 times on 28 August). One explosion on 29 August 2011 ejected material 250 m above the crater. According to the article, activity decreased after 29 August. The article also noted that 222 people remained at temporary refugee camps because their homes were located within 3 km of the crater. CVGHM reported that on 10 October 2011 white and gray plumes rose 100-300 m above Tompaluan crater. Based on information from CVGHM, the Darwin Volcanic Ash Advisory Centre (VAAC) reported that on 11 October an ash plume rose to an altitude of 2.1 km. According to a news article (Kompas.com), a gray plume rose 1.2 km above Tompaluan crater and drifted SW on 26 October, followed by an explosion that sent incandescent material as far as 800 m away from Tompaluan crater. A second eruption produced a plume that rose 500 m above the crater. Information Contacts: Center of Volcanology and Geological Hazard Mitigation (CVGHM), Jalan Diponegoro 57, Bandung 40122, Indonesia (URL: http://www.vsi.esdm.go.id/); Darwin Volcanic Ash Advisory Centre (VAAC), Bureau of Meteorology, Northern Territory Regional Office, PO Box 40050, Casuarina, NT 0811, Australia (URL: http://www.bom.gov.au/info/vaac/); Straits Times (URL: http://www.straitstimes.com); BNO News (URL: http://www.bnonews.com/); Kompas.com (URL: http://www.kompas.com/); Antara News (URL: http://www.antaranews.com/en/); Daijiworld News (URL: http://www.daijiworld.com/). Our previous report on Lokon-Empung volcano noted activity to late-October 2011 (BGVN 36:11). The present report adds subsequent information through May 2012. Most of the following information was based on summaries of activity by the Center of Volcanology and Geological Hazard Mitigation (CVGHM; also known as Pusat Vulkanologi dan Mitigosi Bencana Geologi-PVMBG) and the Volcano Disaster Assistance Program (VDAP). A map of Indonesia showing the location of Lokon-Empung volcano is presented in figure 9, and figure 10 shows a hazard map of the area around the volcano. Figure 9. Map of Indonesia showing the location of Lokon-Empung volcano on the N tip of Sulawesi. Courtesy of CVGHM and VDAP. Figure 10. A sketch map showing the location of Lokon-Empung volcano and various nearby hazard zones and populated areas. Courtesy of the CVGHM and VDAP. Following the 26 October 2011 explosion from Tompaluan crater (the most active vent, located in the saddle between the peaks of Lokon to the S, and Empung to the N; see fig 10) that sent incandescent blocks up to 800 m away from the crater (BGVN 36:11), a small eruption was reported on 7 November. The Alert Level remained at 3 (on a scale of 1-4) since 24 July 2011. Three explosions from Tompaluan crater were recorded by CVGHM on 27 December 2011, along with 23 deep volcanic earthquakes and 40 shallow volcanic earthquakes. Explosions from the crater produced ash plumes on 9-12 and 21 February 2012 (figure 11). Figure 11. PALAKAT news agency eruption photo from 9 February 2012, taken from the outskirts of the city of Tomohon (~5.3 km SW on Tokon volcano), looking NW. Lokon volcano is to the left, and Empung volcano is the flat-topped edifice to the right. The eruptive column is issuing from the Tompaluan crater. Courtesy of CVGHM and VDAP. Lokon-Empung's activity increased during 23 April 2012, when there were 180 volcanic earthquakes. On 24 April an eruption was accompanied by loud "thumping" noises heard at local observation posts, though fog prevented views of the crater. Satellite observations on 25 April showed ash and block deposits from this eruption scattered to the N and E of Tompaluan crater out to a distance of ~400 m from the crater rim. The Darwin Volcanic Ash Advisory Centre (VAAC) reported on 1 May 2012 that ash plumes were detected in satellite imagery and reported by ground-based observers. The Jakarta Post reported that Lokon-Empung erupted on 2 May 2012 at 1155. This eruption was larger in magnitude than the one on 24-25 April 2012. The 2 May eruption was preceded by a number of mild earthquakes that occurred over a span of 2 min. A report noted that "smoke" plumes reached an altitude of 2.5 km. Table 10 gives a chronological listing of activity at Lokon-Empung from 1 November 2011 to 1 May 2012. Table 10. Darwin VAAC plume observations at Lokon-Empung volcano for November 2011-2 May 2012 (with times in UTC). Note that meteorological clouds often obscured satellite observations. 'VA' denotes volcanic ash plume; '--' denotes data not reported. 'Remarks in VAAC reports' includes CVGHM observations typically made from the ground, as well as some media sources. Courtesy of Darwin VAAC, CVGHM, and VDAP. 27-28 Dec 2011 -- VA: 1.5 km Low level eruption reported by media. 29 Dec 2011 0415 -- VA reported by CVGHM, altitude 3.7 km. 06 Jan 2012 -- -- VA, altitude 1.5 km. 09 Feb 2012 0020 VA: 2 km Explosion preceded by 16 hrs of increasing seismicity. 10 Feb 2012 0145-0315 -- VA reported from ground, altitude 2.4-3.4 km. 11 Feb 2012 0330 -- VA reported from ground, altitude 3 km, preceded by 16 hr of increasing seismicity. 21 Feb 2012 0352, 0356 -- Two moderate-intensity explosions. 24 Apr 2012 -- -- Minor-intensity, explosive eruption; diffuse white plumes rose 25-50 m above Tompalaun crater, scattered ash and block deposits N and E of crater out to distance of ~400 m from crater rim. 01 May 2012 0532 Low level VA, 2.3-3.7 km VA and low level eruption reported 74 km to N from ground. Information Contacts: Center of Volcanology and Geological Hazard Mitigation (CVGHM), Jalan Diponegoro 57, Bandung 40122, Indonesia (URL: http://www.vsi.esdm.go.id/); Volcano Disaster Assistance Program (VDAP), US Geological Survey (USGS), 1300 SE Cardinal Court, Bldg. 10, Suite 100, Vancouver, WA 98683; Darwin Volcanic Ash Advisory Centre (VAAC), Bureau of Meteorology, Northern Territory Regional Office, PO Box 40050, Casuarina, NT 0811, Australia (URL: http://www.bom.gov.au/info/vaac/); The Jakarta Post (URL: http://www.thejakartapost.com/); Kompas.com (URL: http://www.kompas.com/); Straits Times (URL: http://www.straitstimes.com); Antara News (URL: http://www.antaranews.com/en/); Daijiworld News (URL: http://www.daijiworld.com/). This report discusses ash-bearing eruptions seen during the reporting interval, 15 September 2012 to April 2013. As described in our 2012 report (BGVN 37:05) the twin volcanoes of Lokon-Empung have remained restless since 2008, typically with small eruptions amid seismic unrest. Recent activity is based on summaries that have been posted by the Center of Volcanology and Geological Hazard Mitigation (CVGHM, also known as Pusat Vulkanologi dan Mitigosi Bencana Geologi-PVMBG). The active crater is referred to as Tompaluan, a vent that resides in the saddle between the peaks of Lokon and Empung (figure 12). An estimated 120,000 people live within 10 km of the volcano. Lokon-Empung lies 20 km S of Manado, the second largest city in Sulawesi (2010 pop. 2.27 million), a metropolis served by the Sam Ratulangi International Airport that closed for four days during Lokon's 1991 eruption (see figures 9 and 10 in BGVN 37:05). In April 2012, CVGHM raised the hazard Alert Level to 4 (on a scale of 1-4). Figure 12. Lokon-Empung volcano showing the Tompaluan vent between the two principal volcano peaks. Photo by Agus Solihin, 1998 (Volcanological Survey of Indonesia). According to the Darwin Volcanic Ash Advisory Center (VAAC), ground based observers reported that on 15 September (2012) an ash plume from Lokon-Empung rose to an altitude of ~3 km. Satellite imagery showed the ash plume drifting 185 km SE. Another ash plume was reported on 21 September, rising to an altitude of ~3 km; however, in this case an ash plume was not identified in satellite imagery. According to the Darwin VAAC, CVGHM reported that on 6 October an ash plume from Lokon Empung rose to an altitude of ~3.7 km; the plume altitude was determined by wind data. A thermal anomaly was also detected in satellite imagery on 6 October. Several news sources (Examiner.com, Jakarta Globe, XINMSN News (Singapore), Jakarta Post) were amalgamated to describe the October activity. According to a news article, an eruption on 7 October 2012 ejected incandescent tephra as high as 350 m above the crater and generated an ash plume that rose ~1.5 km. The article also noted that Lokon Empung had erupted 41 times in September and 3 times on 5 October. Government volcanologist Farid Bina reported from the volcano's monitoring post in North Sulawesi province, "The eruption on 7 October was the seventh biggest eruption since mid-September". Thunderous sounds were heard nearly 6 km away. The National Agency for Disaster Management (BNPB) said the eruption ejected debris 350 m high and produced an ash plume at least 1.5 km high that drifted NE. It wasn't clear how high the ascending ash actually reached because the mountain was engulfed in ash and heavy rain fell around its cloud covered crater. Bina said that there were no casualties or damages. The head of North Sulawesi Disaster Mitigation Agency (BPBD), Hoyke Makarawung, said that the amount of ashfall blanketing the affected areas was insignificant. BPBD reminded residents about the danger of respiratory ailments, urging those in ash-prone areas to wear masks. A 2.5-km exclusion zone around the volcano continued to be enforced during this heightened activity. Figure 13 shows Lokon-Empung erupting on 8 October 2012. The plume rises from Tompaluan, the active vent at Lokon which lies in the saddle between the two peaks. The ash column mixed with atmospheric clouds, rising to an uncertain altitude. Figure 13. Lokon-Empung eruption seen 8 October 2012. Courtesy of the Reuters.com and Guardian.cu.uk. Based on a Significant Meteorological Notice (SIGMET), the Darwin VAAC reported that on 11 November an ash plume from Lokon Empung rose to an altitude of ~1.5 km. The VAAC again reported that on 28 November, an eruption from Lokon Empung produced an ash plume that rose to an altitude of ~4.9 km; the plume was not however detected in satellite imagery. On 6 December, Lokon emitted a billowing ash plume (figure 14) that produced ash that fell mostly on the SE flank. Milder activity resumed on 8 and 9 December as shown in figures 15 and 16. December's second small eruption took place on 10 December. Figure 14. Two views of the ash plume emitted at Lokon on 6 December 2012. Courtesy of Photovolcanica.com. Figure 15. The Tompaluam vent at Lokon-Empung viewed at night on 8 December 2012. Courtesy of welt.da. Figure 16. Lokon degassing on 9 December with red and orange glow reflecting of a blowing plume; and a small emission on 10 December. Courtesy of Photovolcanica.com. The eruptions seen on 6 and 10 December were typical of Lokon's recent behavior. They involved a succession of overlapping explosions resulting in sustained ash emission and the production of an ash plume. According to Darwin VAAC, these two eruptions produced ash clouds reaching ~3.4 and~ 4.3 km in altitude, respectively. According to CVGHM there were no reports of casualties or damages during the December 2012 eruptions. Enlarging the current exclusion zone by specifying a new radius of larger size would cut the main road connecting the towns of Manado and Tomohon and thus burden a much larger population. Consequently, the Alert Level was held at "3" (out of 4) that has been in effect since July 2011. Immediate precursors to eruptions at Lokon are typically small and of short duration (minutes to hours), and eruptions may occur with very little additional warning. In January (2013), based on ground reports, the Darwin VAAC reported ash plumes from Lokon-Empung rose to an altitude of ~2.4 km during the period 2-8 January, that report was not however confirmed by satellite imagery. The VAAC again issued a special Notice to Airmen (NOTAM) for volcanic ash during 15-16 January, again based on reports from CVGHM and the Aviation Volcanic Information site (ASHTAM - www.ashtam.co.uk). The ash plumes reportedly rose to altitudes of ~3.7 4.5 km, but satellite imagery did not confirm the ash reports. According to news articles, Lokon Empung erupted twice on 31 January, producing an ash plume that rose 800 m above the crater after the first eruption. Seismicity had increased the day before. In another article the head of the Lokon observation post reported that eruptions from Lokon occurred daily, and specifically that nine eruptions had occurred on 2 February. The CVGHM reported that a significant explosion occurred at Lokon on 3 February which produced an ash plume which rose ~3-4 km and which drifted S and SW, but the ash plume was not detected in satellite imagery. CVGHM observers at the Kakaskasen Volcano Observatory (KKVO) in North Sulawesi, Indonesia reported increased seismic unrest on 9 February. The character of the seismicity suggested to CVGHM that a magmatic intrusion was occurring. Lokon did erupt on 12 February. Seismicity remained elevated at Lokon and small explosions have been occurred frequently. On 20 March, the Jakarta Post reported a new eruption at Lokon which spewed a ~2 km m high dark brown and black ash cloud from the Tompaluan crater, easily visible from Manado, the regional capital to the NE, and was heard up to 6 km distance. Farid Ruskanda Bina, head of Mount Lokon and Mount Mahawu observation post at the Bandung Geology Agency's volcanology and geological disaster mitigation center (PVMBG) reported "There was an increase in volcanic tremors which culminated in an eruption" (Antara News). Warno, an official at the observation post, added that the increases in Mount Lokon's volcanic tremors were not very significant. The frequency of the volcano's eruptions has continued to decline from previous eruptions of two to three times a week. A series of 3 moderately large explosions occurred on 25 March that was followed by minor ash emissions. Mount Lokon erupted again from the Tompaluan crater on 26 March, again with ash plumes rising up to ~2 km above the vent. Residents heard a loud boom after the eruption. Indonesia's National and Local Board for Disaster Management and Volcanology agency warned people not to go within 2.5 km of the volcano; authorities held the situation at Alert Level 3 but, however have not advised residents to evacuate the area. There were no reports of casualties, but three villages in the area, Dalian, Wadena and Walloon were covered in ash from the eruption. On 2 April, seismicity at Lokon increased. Based on both CVGHM and ground reports, the Darwin VAAC reported that on 3 April an eruption from Lokon Empung produced an ash plume that rose to altitudes of ~3 3.4 km and drifted SW. New explosions occurred on 4 April. Volcanic ash plumes reached 700 m above the crater and were blown to the S. Another explosion occurred on 8 April. A relatively large ash plume rose about 3 km above the crater to an altitude of ~4.5 km and drifted SW. The eruption was heard up to 6 km away. The volcano observatory recorded that the eruption was preceded by a strong increase in seismicity. After the main eruption, the volcano continued to erupt ash. Based on both web-camera views and ground reports, the Darwin VAAC reported that on 11 April an ash plume from Lokon rose to an altitude of ~4.6 km and drifted SW; but the ash plume was not confirmed by satellite imagery. Another relatively large eruption occurred on 14 April. The explosion produced an ash plume ~4 km high, and strong vibrations were felt up to 5 km from the volcano. KKVO is monitoring the activity closely using equipment for a volcano hazard mitigation project in Indonesia. Information Contacts: Center of Volcanology and Geological Hazard Mitigation (CVGHM), Jalan Diponegoro 5+7, Bandung 40122, Indonesia (URL: http://www.vsi.esdm.go.id/); Darwin Volcanic Ash Advisory Centre (VAAC), Bureau of Meteorology, Northern Territory Regional Office, PO Box 40050, Casuarina, NT 0811, Australia (URL: http://www.bom.gov.au/info/vaac/); The Jakarta Post (URL: http://www.thejakartapost.com/); Jakarta Globe (URL: http://jakartaglobe.id/); Kompas.com (URL: http://www.kompas.com/); Straits Times (URL: http://www.straitstimes.com); ITN News (URL: http://www.itn.co.uk/); Volcano Discovery (URL: https://www.volcanodiscovery.com/); Activolcans, VSI (webcam); Geoforum; Xinhua; NewKerala. The twin volcanoes Lokon and Empung, rising about 800 m above the plain of Tondano, are among the most active volcanoes of Sulawesi. Lokon, the higher of the two peaks (whose summits are only 2 km apart), has a flat, craterless top. The morphologically younger Empung volcano to the NE has a 400-m-wide, 150-m-deep crater that erupted last in the 18th century, but all subsequent eruptions have originated from Tompaluan, a 150 x 250 m wide double crater situated in the saddle between the two peaks. Historical eruptions have primarily produced small-to-moderate ash plumes that have occasionally damaged croplands and houses, but lava-dome growth and pyroclastic flows have also occurred. A ridge extending WNW from Lokon includes Tatawiran and Tetempangan peak, 3 km away. Matahelumual J, 1986. G Lokon-Empung. Bull Volc Surv Indonesia, 114: 1-52 (in Indonesian). There is no Deformation History data available for Lokon-Empung. Gunung Empung volcano, seen here from the SW near the rim of Tompaluan crater, is lower than its twin volcano, Gunung Lokon. In constrast to Lokon volcano, which lacks a summit crater, Empung volcano contains a 400-m-wide, 150-m-deep crater. 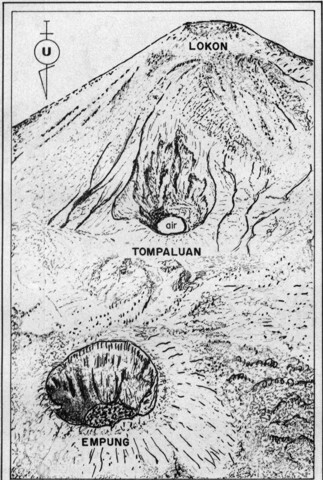 Empung was active during the 14th and 18th centuries, but all eruptions since have occurred from Tompaluan crater, which occupies a saddle between Lokon and Empung. 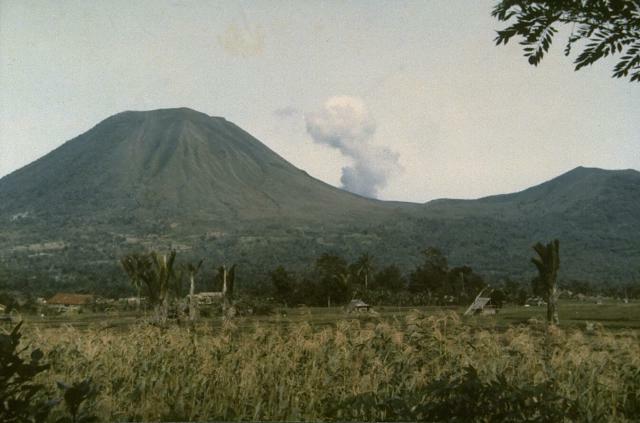 Photo by A.D. Wirasaputra, 1973 (Volcanological Survey of Indonesia). Steam rises from fumaroles on the wall of Tompaluan crater in May 1985 during a quiescent period at the frequently active volcano. The crater, which has been the source of most historical eruptions from Lokon-Empung volcano, lies in a saddle between the two peaks. The floor of the 250 x 150 m wide crater sometimes contains a small lake. An eruption plume, viewed from the east, rises from Tompaluan crater in the saddle between Lokon (left) and Empung (right) volcanoes on July 15, 1986. 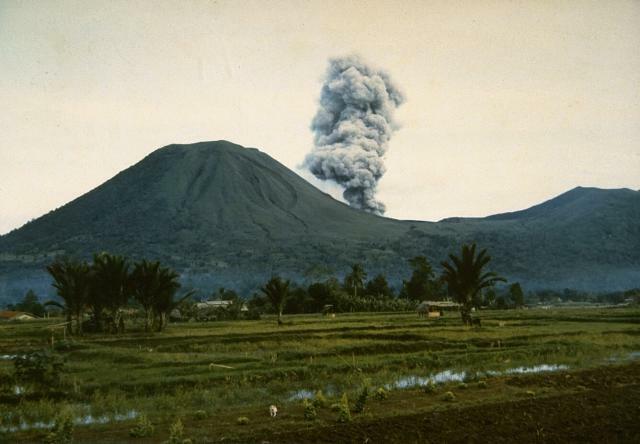 Intermittent explosive eruptions took place from March 22, 1986, until May 13, 1987 from Lokon-Empung, one of the most active volcanoes of Sulawesi Island. Photo by Ruska Hadian, 1986 (Volcanological Survey of Indonesia). The twin volcanoes Lokon (on the left) and Empung (on the right) rise above Tondano Plain. Steam rises from Tompaluan, a double crater between the two peaks. 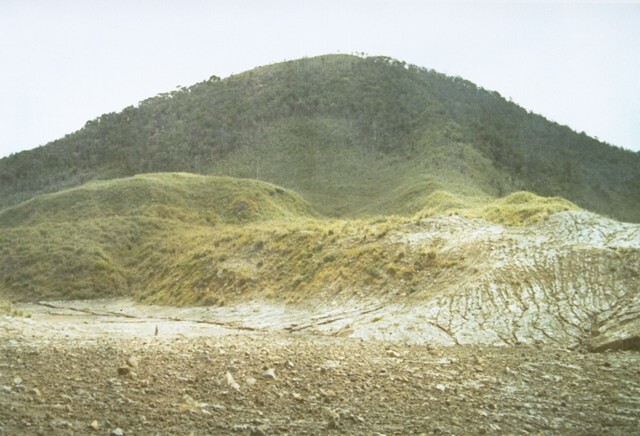 The higher peak, 1580-m-high Lokon, has a flat, craterless summit, whereas Empung, which was active prior to 1800, has a 400-m-wide summit crater. All eruptions of Lokon-Empung since 1826 have originated from Tompaluan crater between the two peaks. A small ash eruption from a vent at the bottom of Tompaluan crater on Lokon-Empung volcano is seen from the crater rim on July 20, 1986. The eruption, which began in March, lasted until May of the following year. 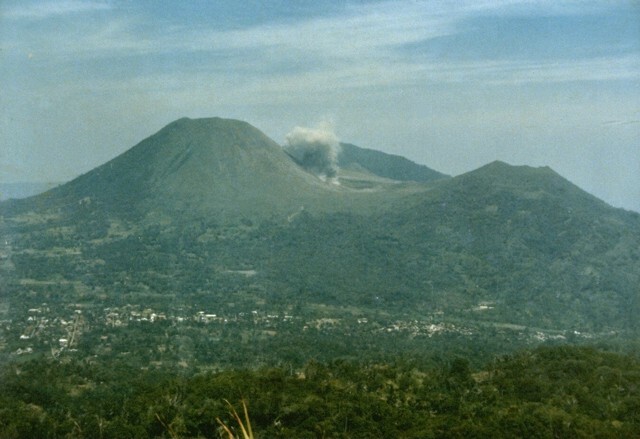 A small ash plume, viewed here from the east on the slopes of Mahawu volcano, rises on September 15, 1986 above Tompaluan crater in the saddle between Lokon and Empung volcanoes. 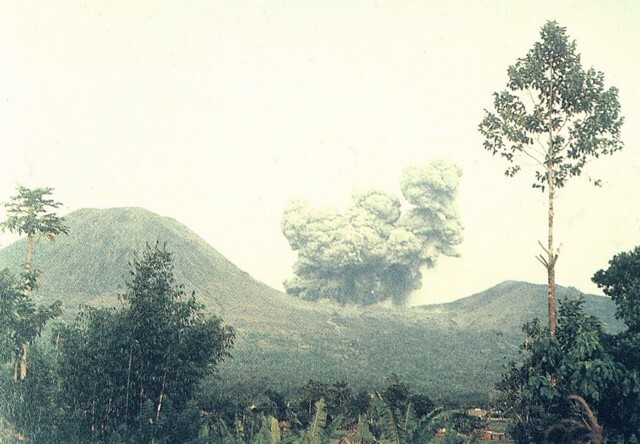 This was one of many explosions that occurred at Lokon-Empung during an eruption between March 1986 and May 1987. The peak behind the eruption plume is Gunung Tetawiran, part of a volcanic ridge that extends to the NW from Lokon volcano. A large eruption plume plume rises above Tompaluan crater in the saddle between Lokon (left) and Empung volcanoes on May 13, 1987, the final day of a period of intermittent eruptions that began in March 1986. The initial explosions on March 22 and 24 and May 10 ejected the crater lake water, and lahars occurred during the latter two days. Ashfall during the eruption damaged house roofs and rice fields. Photo by S.R. Wittiri, 1987 (Volcanological Survey of Indonesia). The twin volcanoes Lokon and Empung rise 800 m above the plain of Tondano. The more prominent Lokon volcano, seen here from the Kakaskasen Volcano Observatory on the SE, is higher than Empung volcano, part of which is visible at the right. 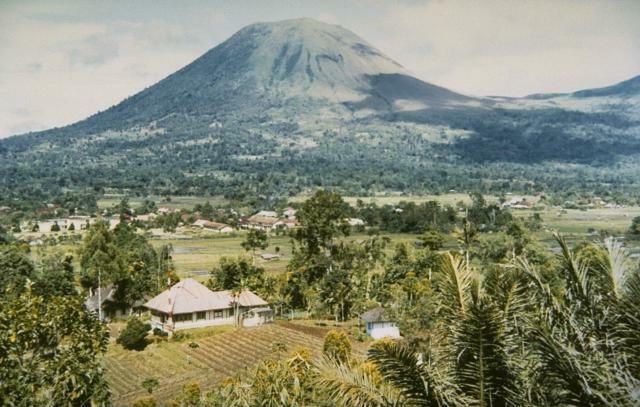 Most historical eruptions from Lokon-Empung, one of the most active volcanoes on Sulawesi Island, have originated from Tompaluan crater, located at the right in the saddle between the two peaks. Photo by S.R. Wittiri, 1990 (Volcanological Survey of Indonesia). An ash column rises above Tompaluan crater between Lokon and Empung volcanoes in November 1991. Explosive eruptions began on 17 May 1991, continuing at a rate of 7-16 a week. 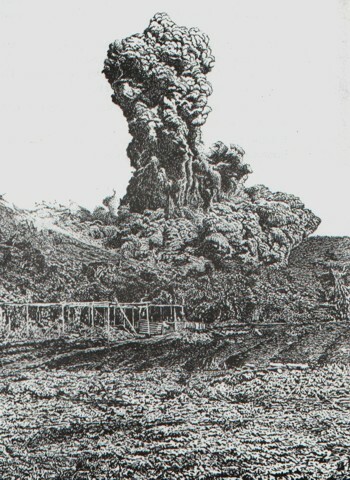 About 10,000 people evacuated following a 25 October explosion that produced 0.015 cu km tephra and was accompanied by a pyroclastic flow that traveled 1.5 km to the east. The number of explosions decreased in November and December, and the eruption ended in January. A small lava plug appeared in the crater after the main eruption. 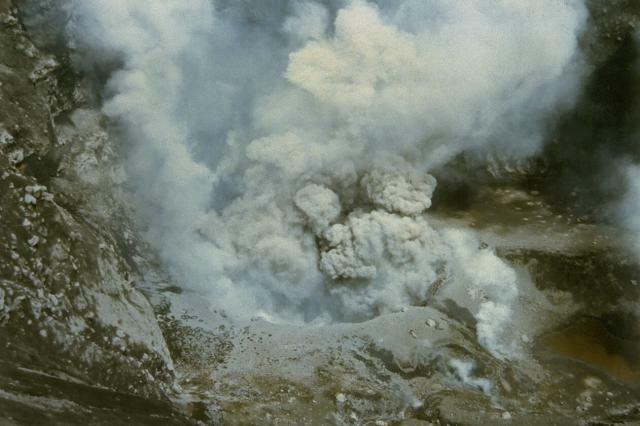 Photo by Syamsul Rizal, 1991 (Volcanological Survey of Indonesia). This sketch from a photo shows an aerial view of the Lokon-Empung volcanic complex from the north on August 23, 1982. The 400-m-wide, 150-m-deep crater of Empung volcano, which last erupted during the 18th century, is at the lower left. Almost all historical eruptions from Lokon-Empung have originated from Tompaluan crater, located in the saddle between Lokon and Empung. The word "air" in the bottom of the crater means water in Indonesian; a shallow lake periodically appears on the floor of the crater. Photo courtesy of Volcanological Survey of Indonesia. Intermittent eruptive activity at Lokon-Empung began on February 17, 1958 and lasted until December 23, 1959. Ash and incandescent material was frequently ejected, affecting nearby villages. On May 3, 1958, the large vertical eruption column and basal pyroclastic-surge cloud seen in this photo was ejected along with fire fountains 100 m from the side of the crater. An eruption the following day damaged farm crops. On May 17 a lava plug was observed in the crater. Frequent small-to-moderate ash eruptions continued through 1959. Photo courtesy of Volcanological Survey of Indonesia, 1958. An eruption plume rises from Tompaluan crater above the coastal city of Manado on June 22, 1959. This was part of intermittent eruptive activity from Lokon-Empung volcano that began on February 17, 1958 and lasted until December 23, 1959. Ash and incandescent material was frequently ejected, affecting nearby villages. The peak at the right is Gunung Tatawiran, a volcanic cone immediately to the west of the historically active Lokon-Empung volcanic complex. Photo courtesy of Volcanological Survey of Indonesia, 1959. The twin volcanoes Lokon and Empung rise above the towns of Kakaskasen and Kinilow as viewed from the flanks of Mahawu volcano. The more prominent Lokon volcano (left), is higher than Empung volcano (right) and lacks a summit crater. Most historical eruptions from Lokon-Empung, one of the most active volcanoes on Sulawesi Island, have originated from Tompaluan crater, which can be seen surrounded by fresh ash deposits in the saddle between the two peaks. Gunung Tetawiran rises beyond the saddle. Photo by Agus Solihin, 1998 (Volcanological Survey of Indonesia). There are no samples for Lokon-Empung in the Smithsonian's NMNH Department of Mineral Sciences Rock and Ore collection. IRIS seismic stations/networks Incorporated Research Institutions for Seismology (IRIS) Data Services map showing the location of seismic stations from all available networks (permanent or temporary) within a radius of 0.18° (about 20 km at mid-latitudes) from the given location of Lokon-Empung. Users can customize a variety of filters and options in the left panel. Note that if there are no stations are known the map will default to show the entire world with a "No data matched request" error notice. Large Eruptions of Lokon-Empung Information about large Quaternary eruptions (VEI >= 4) is cataloged in the Large Magnitude Explosive Volcanic Eruptions (LaMEVE) database of the Volcano Global Risk Identification and Analysis Project (VOGRIPA).